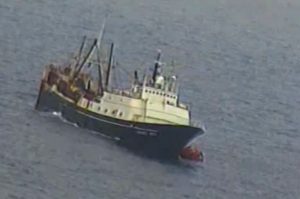 The Fishing Company of Alaska (Renton, Washington) has sold its three remaining factory trawlers and catch quotas to Ocean Peace and O’Hara Corporation. Mike Faris, CEO of Seattle-based Ocean Peace, confirmed that his company will purchase two of the trawlers and catch quotas. O’Hara Corporation Vice President Frank O’Hara Jr. said his company will purchase one trawler and half of the fishing quotas, giving the company a more diverse harvest that includes higher-priced species. Purchase prices for vessels and quotas have not been disclosed. Fishing Company of Alaska once had a fleet of more than six vessels, but vessel sinkings and fines took a toll on the Renton-based company. In 2008, the company was fined nearly $450,000 and paid NOAA Fisheries to settle charges of fishing in closed areas as well as other illegal activity. It was one of the largest fines ever paid for fishery conservation violations at the time. In 2007, the ALASKA RANGER sinking killed five crew members. In 2016, the ALASKA JURIS sank, and while there was no loss of life, 46 crew members had to be rescued. The Coast Guard continues to investigate, focusing attention on maintenance of the company’s aging vessels. Mr. Faris said that Ocean Peace will continue operating the vessels but will improve them. “We will invest heavily in the vessels and bring them up to the level of safety and efficiency that we are real comfortable with”. Mr. O’Hara echoed Mr. Faris’s comments, stating that O’Hara Corporation is devoted to upgrading the acquired vessel.